On August 9, 1790, after a three year voyage, the ship Columbia returned to Boston after circumnavigating the globe. Captain Robert Gray and his crew made history, being the first Americans to make such a voyage. The goal was to sail to the American Northwest for trading purposes, which then led to further passage west to Canton, China. Trade routes to both destinations thrived quickly after this journey. Captain Robert Gray also discovered the Columbia River in 1792. Quoting Columbia's fifth-mate John Boit, Jr., in Samuel Eliot Morison's 1921 Maritime History of Massachusetts, "[We] saw an appearance of a spacious harbor...The river extended to the N.E. as far as the eye could reach, and water fit to drink as far down as the bars at the entrance. We directed our course up this noble river in search of a village. The beach was lined with Natives, who ran along shore following the ship. 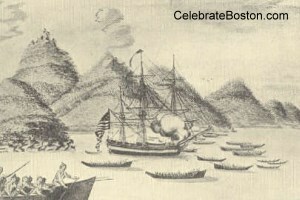 Soon after, about 20 canoes came off, and brought a good lot of furs and salmon, which they sold two for a board nail...Captain Gray named this river Columbia's and the North entrance Cape Hancock, and the South Point, Adams." At that time, the term Columbia was considered the female personification of Liberty, as represented by the new United States, and had derived from the name of the earlier great explorer Christopher Columbus. The song Columbia, The Gem Of The Ocean, was an unofficial national anthem of the United States for many years. The Space Shuttle Columbia was given her name from Robert Gray's ship. 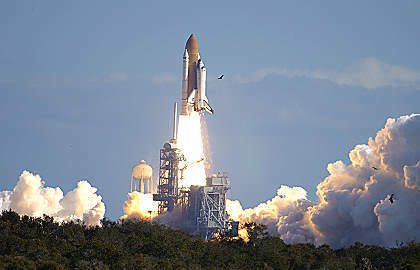 Columbia was the first space shuttle to fly into earth orbit, having launched on April 12, 1981. The orbiter Columbia flew 28 missions of discovery, and was a pioneer in the application of re-usable spacecraft and in scientific experimentation in space. NASA's Reflections website describes the tragic loss of Columbia: "The Columbia STS-107 mission lifted off on January 16, 2003, for a 17-day science mission featuring numerous microgravity experiments. Upon reentering the atmosphere on February 1, 2003, the Columbia orbiter suffered a catastrophic failure due to a breach that occurred during launch when falling foam from the External Tank struck the Reinforced Carbon panels on the underside of the left wing. The orbiter and its seven crewmembers (Rick D. Husband, William C. McCool, David Brown, Laurel Blair Salton Clark, Michael P. Anderson, Ilan Ramon, and Kalpana Chawla) were lost approximately 15 minutes before Columbia was scheduled to touch down at Kennedy Space Center."